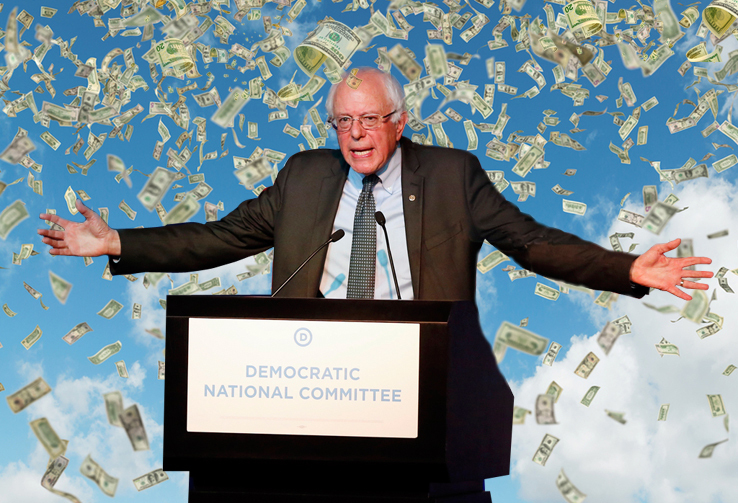 This is probably not the future Bernie Sanders had in mind for the Democratic Party. Image via Think Progress. The first version of this post was published in The Gate, and it solely focused on the 2018 gubernatorial races. I updated a few things in this article and also added a section on New Jersey’s 2017 gubernatorial race. If you thought the days of billionaires running for office were over, think again. In the aftermath of the 2016 election, Democrats are struggling to figure out what their future holds. Interestingly, the party establishment’s vision for its future seems to look a lot like the Republican Party today, with rich donors lining up to run for governor in New Jersey in 2017 and three key states in 2018—outsider candidacies that in some ways resemble Donald Trump’s successful presidential campaign. After Hillary Clinton almost doubled Trump in spending but still lost the White House, some Democratic donors felt as if their money had been set on fire. These wealthy donors may very well be thinking that if Trump could win the presidency, then perhaps there is a chance for Democratic billionaires to win on the state level. Although this strategy may seem hypocritical and out of step with the working-class direction Bernie Sanders wants to take the Democratic Party after the wreckage of the 2016 election, it might not be that crazy. One of the few success stories that Democrats had in 2016 was in West Virginia, where they continued the state’s trend of electing Democratic governors by electing Jim Justice, a Democratic billionaire and successful coal baron. There are four states where it seems that similar Democratic billionaires will run for statewide office in upcoming elections: New Jersey, California, Florida, and Illinois. Both rocketed to the top of Wall Street, enabling them to spend millions of dollars of their own fortunes to run as novices for statewide office. And both played checkbook politics, showering thousands of dollars upon crucial Democratic organizations and candidates. Murphy’s early entry, combined with the millions of dollars he invested at the onset of his campaign has helped propel this former Goldman Sachs executive to the front of the Democratic primary. Once dominated by older Democrats in their seventies and eighties, California is slowly seeing some generational turnover. Kamala Harris was just elected to replace Barbara Boxer as senator, and Jerry Brown (who was the first elected governor to succeed Ronald Reagan in 1974) is not running for re-election in 2018. This leaves the door wide open for Tom Steyer, the single largest individual contributor to candidates in the 2016 cycle, who invested millions of dollars on behalf of Democrats across the country, including himself. The longtime philanthropist and environmentalist launched his own ads supporting a tobacco tax increase (despite his millions invested in tobacco companies) and starred in his own Spanish-language ad attacking Trump. Although Steyer is likely to be the only billionaire to run for governor of California in 2018, he may well be joined by multimillionaire Steve Westly, who made much of his money working at eBay. Westly was the former state Controller and spent $35 million of his own money during his failed 2006 gubernatorial campaign. If he runs, it will likely be from closer to the center than Steyer, as Westly sees the likelihood of two Democrats running against each other in the general election as one that would be favorable to him. In California, all candidates compete on the same primary ballot and the top two advance to the general. In 2016, Democratic Congresswoman Loretta Sanchez was the more moderate of the two Democrats and tried to garner Republican support for her campaign, ultimately coming far short and losing to Senator-elect Kamala Harris by almost 3,000,000 votes, despite Republican Darrell Issa’s endorsement of Sanchez. Westly has attempted to address the ongoing controversy by meekly saying that “I clearly made a mistake here,” so he is likely to continue to deal with its consequences. Since statewide offices seemingly only open up once in a blue moon in California, Steyer will have his work cut out for him to boost his name recognition over what is sure to be a massive field. Indeed, such an opening is so prized amongst California Democrats that the current lieutenant governor, Gavin Newsom, has been running for governor since 2015. Interestingly, Republicans are looking at a billionaire of their own to run for governor. Peter Thiel, the co-founder of Paypal, is being wooed by many in the California Republican Party to give it a shot. The Sunshine State was a complete disaster for Democrats in 2016, with their only success being Charlie Crist’s election to Congress. In 2018, Democratic senator Bill Nelson will be up for reelection, and Republican governor Rick Scott will be term-limited out of office, so both parties will have at least one major potential pickup opportunity. Scott himself seems to be a potential opponent to Nelson, but Scott’s seat will be open no matter what he decides to do. Democratic multimillionaire donor John Morgan is considering a run for governor. Morgan is known for his law firm’s website, ForThePeople.com, and will enter the race with at least some name recognition outside donor circles due to the firm’s popular ads, which tout him as “the bullies’ bully” and “the people’s lawyer. However, Morgan faces several challenges. He was at the forefront of funding Florida’s medical marijuana referendum, which passed overwhelmingly. This put him at odds with former DNC chair Debbie Wasserman-Schultz, as well as the popular Polk County sheriff Grady Judd, whom Morgan was filmed cursing at in a bar. As in California, this primary is sure to be competitive, but Morgan looks to be in a better starting position than Steyer, at least for now. Unlike Steyer and Morgan, Pritzker has previously run for office, and his wealth was not enough. He campaigned for an open House seat but fell to Jan Schakowsky in the primary despite spending more than $1 million of his own money. Money matters in campaigns, but it is far from everything. Interestingly, Illinois might be shaping up to have a primary between a Pritzker and a Kennedy. Robert F. Kennedy’s son, Chris, is hiring staff to prepare for what seems to be an inevitable gubernatorial campaign. He has also met with Illinois House Speaker Mike Madigan to discuss his potential candidacy, although he did not want to talk about the conversation with reporters. However, Kennedy has flirted with running for office in the past. In 2009, a source told reporters that there was an “85 percent chance” he would run for the Senate seat vacated by Obama, but he ultimately never went through with that. At the Democratic National Convention, he “literally ran away from reporters,” an unpromising sign from a potential candidate. Illinois’s primary has seen fewer Democratic contenders express interest than California’s or Florida’s, but it is all but certain that Pritzker and Kennedy will have some company. Former governor Pat Quinn, who lost decisively to Rauner in 2014, is even considering a comeback bid. A fight between the Pritzkers and the Kennedys will be one to watch, and Rauner will certainly enjoy sitting back and watching the fireworks. As Democrats ponder their future, these four races will offer some insight into whether their loathed “billionaire class” will move from simply donating to candidates to being candidates themselves. While these campaigns certainly will not lack funding, Democrats have also learned that outspending opponents is no guarantee of success if the candidate is not appealing to voters. Don’t tell Bernie Sanders, but 2018 might be shaping up to be a great year to be a billionaire for Democrats running in crowded primaries.